Dynamic submission comes with a built-in Meta Tag Editor that will help you create and modify your keywords, description, and Web title for your Web page with a single click. You can even edit multiple HTML files at once. 1. Select web projects, web profiles or URLs for your submission (you may select multiple items). If you do not have them you might want to create them first. In doing this you need enter all the site details (refer to Create a Web Profile for details). 2. 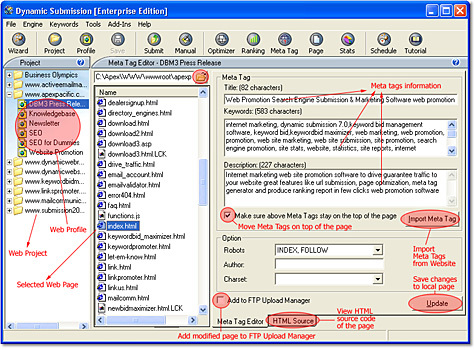 Simply click on “Meta Tag” button on the main tool bar or go to “Tools/Meta Tag Creator” menu item from the menu bar to pop up the “Meta Tag Editor” window. Click the “Import Meta Tag from Web Site” button and then select the Web Site URL from the list, the program will retrieve the "title", "keyword" and "description" Meta Tags from your specified URL automatically. Browse and select the local folder that contains your local HTML files at the left hand side and then double click on the those files to retrieve their Meta Tags. Click the "Open Folder" icon on the top (next to the text box containing a folder path) to go to the upper directory.